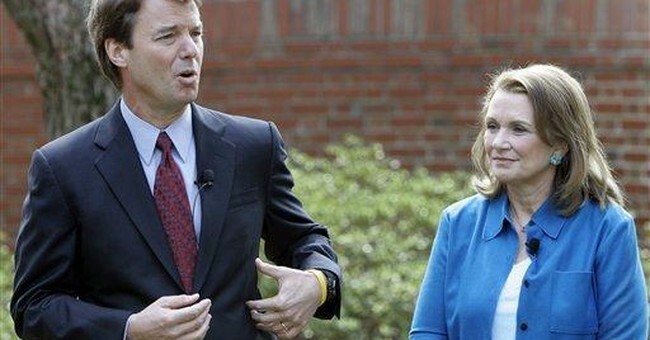 You can call the man a so-and-so if you want, but John Edwards' decision to go on with his presidential campaign, in the face of his wife's untreatable breast cancer, pairs perfectly with modern expectations about the White House and the exhilaration of the chase that leads there. The main modern expectation, perhaps, is that a man (or woman) will do whatever is necessary to get there. So close your eyes. Ignore the racket and stench as the campaign wears on -- if you can, considering how long campaigns go on nowadays, and what goes on with them. A U.S. presidential campaign is no walk in the park on a bright spring day, with the birds twittering merrily about us. Whoever seriously runs for president these days undertakes to think of virtually nothing else. A presidential campaign is monomaniacal, which should make us wonder more than we do about the monomaniacs who so often take up these exercises in self-fixation. Probably we shouldn't vote for anyone who actually wants to be president, on the theory that wanting to be president is unhealthy. But that won't work. There would be no one to vote for. Question: Why would any healthy person want to work the telephones three or four hours a day, hitting up friends and strangers for the multimillions it takes to run a modern campaign? Why would any healthy person want to travel continuously around the country, living out of roller bags, dressing in front of hotel mirrors, trundling off to campaign breakfasts followed by campaign lunches followed by campaign dinners, wearing out the grin muscles, telling the same tired jokes, trying to look interested in the importunities of local well-wishers, phoning from cars, lobbies, private planes, asking, asking, asking, begging, begging, begging, promising, promising, promising? Why? Often enough, it's because the people who do so can't help themselves. They're hooked on power. The 21st century U.S. presidency is power incarnate -- power to do good, to lead the world, to make people everywhere sit up and pay attention to you. Not always the kind of attention you want paid you -- true. Everybody in the world knows George W. Bush. A goodly number of those folk, here as well as abroad, wish -- to put it mildly -- they had never heard of him. Still, the hotel rooms and cell phones beckon. It's the old temptation, the very oldest -- power for power's sake. And the personal fulfillment that goes with believing one's self to be esteemed, perhaps even loved. Why do so many need this reinforcement? No one can know. Candidates need it all the same. It explains the hotel rooms, the microphones, the cold coffee, the corny jokes. A part of it, no doubt, is desire or just willingness to serve -- to give back. That was the old theory. It worked fairly well in American affairs for a long time. The formal assumption in ye olden time -- say, half a century ago -- was that the presidency sought the man, not the man the presidency. Who exactly the man would be wasn't apparent until the political conventions, held about four months before the voting. The campaigns kicked off around Labor Day. In two months' time we were done. On to the inauguration. It would be foolish to say we could still do things so if we just tried. It is not that world anymore. The comparatively passive government we knew at the time is gone. And yet... And yet... How nice it was, comparatively speaking, when presidential campaigning was less the constant obsession, the perpetual pastime, it has become; so that a man's presidential aspirations are automatically presumed to override obligations to wife and children. And to common sense and, occasionally, decency. May the Lord strengthen Elizabeth Edwards in her time of need. How much more debilitated she may be than the rest of us, albeit in a different sense -- hmmm, that one probably can wait.